for his inimical style of Madurai diction. Recently reigning superstars of Malayalam cinema, Mamooty and Mohanlal appreciated Vadivelu and requested him to act in Malayalam films. 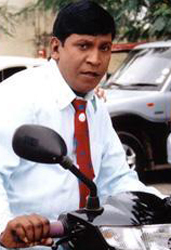 Vadivelu declined the idea saying he was not familiar with the language and that the artiste cannot do justice to the role without being comfortable in the language. Nevertheless, Mamooty had invited him over for lunch and held further discussion. Watch this space for more news.